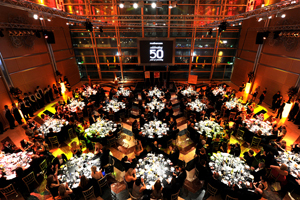 Pre-event planning: To celebrate its 50th anniversary and raise money for one of its key charity partners, Save the Children, Mothercare wanted to organise a Champagne reception and dinner at a central London location for around 300 guests. Mothercare had set a target of raising £70,000. Caterer and event organiser Ampersand selected East Wintergarden for its size and its bright decor. Celebrities invited included broadcaster Myleene Klass, who has worked with the company since 2008. Challenges: The key to success was ensuring the catering for the reception and the three-course dinner went without a hitch. Ampersand's brief included making sure VIPs were looked after and ensuring the timing of the food matched the entertainment, which included an auction, short Save the Children promotional films and performances by actor and comedian Hugh Dennis and The Three Waiters. Solution: A separate VIP area was provided at the venue's Promenade Room and the three-course menu was designed so that if any entertainment overran, it could be kept hot without being overcooked. Post-event analysis: The event attracted 311 guests and raised more than £140,000 for Save the Children. Mothercare event manager Alex Underwood was particularly impressed with the choice of venue and the catering, which was key to successfully persuading guests to donate. She said: "The venue is breathtaking, the food was wonderful and the service was impeccable."